British niche line Miller Harris has launched La Fumée Maroc, the latest in her series of limited edition fragrances based on 2011's La Fumée (now known as La Fumée Classic). Others in the series include La Fumée Arabie (2012) and La Fumée Ottoman (2013); all have been given new packaging for 2014. Capturing the bounty of the bustling souk in the medina, La Fumee Maroc immediately transports you into a succulent melange of plump and juicy apricot, peach and prune. The sensual fleshy fruits evolve into a heart of Moroccan rose and cedar wood. Smoky woods and incense encase this fruity, woody floral journey, while soft leathery musks bring a warm, lactonic and liquorous lasting impression. 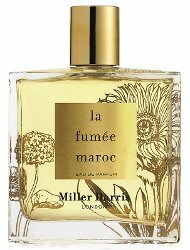 Miller Harris La Fumée Maroc can be found now at Harrods in the UK, in 100 ml Eau de Parfum, £155. I liked the original one, haven’t tried any of the others (although both Arabie & Ottoman sounded really nice)…the new packaging is lovely. though I’d personally prefer silver, love, love, love M-H botanic bottles. Wish they were available in minis. She does do trios in 15 ml, but the bottles are less elaborate. But it usually means desirous…don’t think it’s usually (well, whatever, it’s not usually used in any case) used to mean “boozy”. Hard to say what it means here. Oddly enough, it’s also in the description of Carner Barcelona El Born — 2 in one day! If it’s peachy, I want to try it. Yet another to test! This one is going immediately onto my “must try” list. Oooh now I loved LF Arabie so much that for a (ahem) special birthday and with the aid of some Miller Harris tokens (thanks bro and sister in law!) I bought it. Gorgeous smokey not too rosy leathery vanillic oud. Mercifully Ottoman didn’t strike me so much but this sounds yummy.